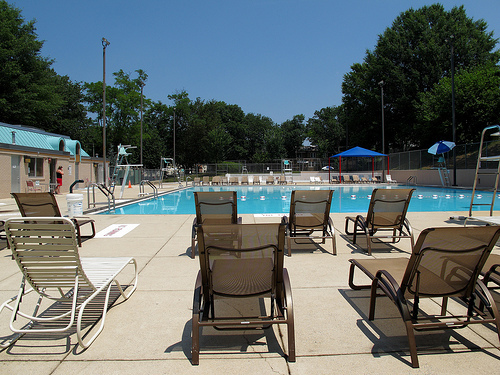 PoPville » Dear PoPville – Water Bottles Banned from DPR Pools? As of last week, it appears that DC Parks and Rec has banned patrons from bringing water bottles to all DC Pools. From what I understand, a DC health official shut down/fined Wilson Aquatics Center for allowing swimmers to have water bottles on the pool deck. They are arguing that allowing water bottles on the pool deck violates District of Columbia Register Vol. 55 No. 52 Part 1 Section 6403.4(f) (December 26, 2008). The regulation basically prohibits “the consumption of food or beverages in areas other than the specifically designated eating areas that are separated from the swimming pool.” I’ve attached the regulation. [DC swimming pool regs – DCR vol 55 no 52 part 1 Dec. 2008] Relevant language on page 7, highlighted. I don’t think this regulations is currently being applied as intended. As you can imagine, this ban on liquids is problematic for people training for swimming events, especially as many DPR facilities don’t have functioning drinking fountains. It will also become increasingly problematic, and a health hazard for everyone, as we move into the summer with increasing temperatures and the opening of the outdoor pools. Marion Barry is the Council Chair over the committee that covers Parks and Rec. Here are the other Council members on the committee. I think contacting Barry or other members of the Council could be helpful.